As part of our ongoing education program at Santa Rita Jail, Planting Justice offered a workshop that featured 'Holistic Wellness' for about 30 incarcerated women. Incarcerated women are often overlooked because the majority of people incarcerated are men, however working with women prisoners is important too. California holds the largest number of women prisoners of any US State, and has the two largest prisons for women in the world in Chowchilla. We found that many women involved in the class (Planting Justice facilitators, Santa Rita teachers and incarcerated women) felt that they spent much more of their time caring for others than themselves. Caring for ourselves is the foundation for a successful life, which sounds simple but it bears repeating. Caring for ourselves is the foundation for a successful life! This means actually taking the time out of our busy lives and giving that time to practices that fulfill and nourish us. While the wellness wheel includes a broad range of life elements including work/career for most of us investing in our wellness means saying goodbye to a few hours working time to make room for practices that really pay off in the long-run. For those of you who read the Planting Justice Blog regularly, folks who have met our energetic canvassers on the streets, or anyone that knows the Planting Justice family you know that our staff are all activists in our own unique way. One thing that you learn as an activist is the importance of self care. You don't have to identify as an activist to get burnt out, we all know the feeling: fatigue, mental foggyness, stress and anxiety.For activists often our burn out is caused by our passion for making an impact which causes people to over commit, over extend ourselves and be perfectionists. There is a gem here too for folks who are teachers, leaders, hard workers, artists or geeks in their own right. No matter your interests if you are someone who gets into what you are doing, or if your not into what you are doing enough you may experience burn out and stress.The first thing we did in our class on wellness was talk about the signs of stress. It is important that we are all able to recognize our unique signs of stress. When we asked 'what does stress look like, what does stress feel like?' students responded with answeres that included: tired, sweaty palms, shortness of breath, dizzyness, loss of apetite, and over-eating. During our class we went through each element on the wellness wheels and came up with practices and goals for each section. Incarcerated women at Santa Rita jail made their own personalized wellness wheels which will serve as toolboxes and inspiration to take-up activities that promote balance. 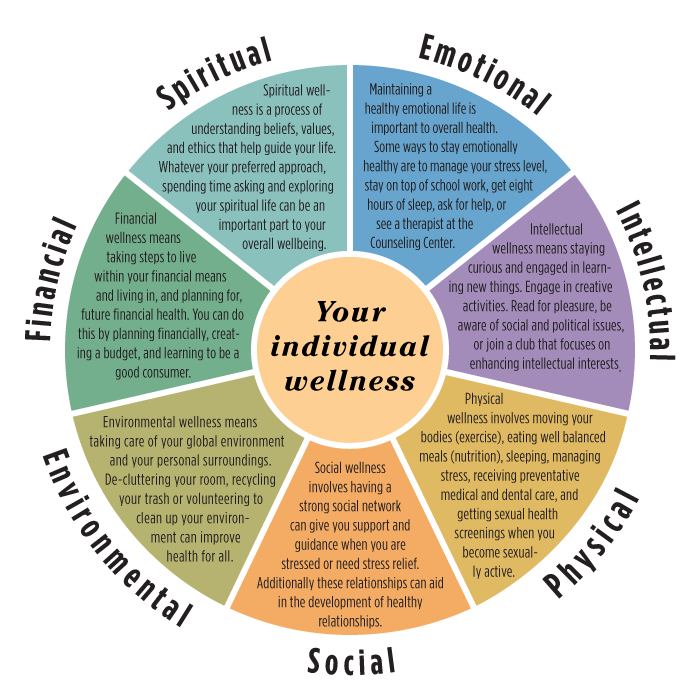 When we look at the holistic wellness wheel our aim is to promote balance between the seven areas of life: emotional, social, occupational/financial, intellectual, physical, environmental and spiritual. What makes this wellness wheel holistic is that it includes our whole lives as essential and does not spereate the spiritual self from the financial self or the physical self. When we talk about physical health for example and we neglect to talk about our emotional health we are drawing artificial boundaries. You don't leave your emotions at home when you go for a run, you don't leave your body when you practice spirituality (well maybe you do but you know what I mean). The holistic aspect refers to wholeness. Burn out and stress can come from any kind of imbalance weather you work too much or you can't find work. If you focus too much on social life or if you're a loan wolf...imbalance can happen. No one is perfect and this achieving balance is a lifelong project. Frankly our 2014 lifestyles make time burdens, energy strains and information overload a part of daily life. Perhaps imbalance is normal in our modern lives but it should be all of our duty to ourselves and community to seek balance. This holistic framing for wellness also allows us to consider how environmental care and protection is also personal care and protection. When asked if humans are a part of nature our Santa Rita classroom resounded with a 'yes'. Holistic visions of wellness provide for understandings of wellness that are rooted in human interconnectedness, and responsible relationships with the environment. In this model, caring for the environment can be synonymous with self care. We posed the question to our Santa Rita students 'if the environment is unhealthy can people be healthy?' and we were pleased to see these folks recognize on a fundamental level our connection to nature and our responsibility to the environment. During our class we went through each element on the wellness wheels and came up with practices and goals for each section. Students made their own personalized wellness wheels which will serve as toolboxes and inspiration to take-up activities that promote balance. 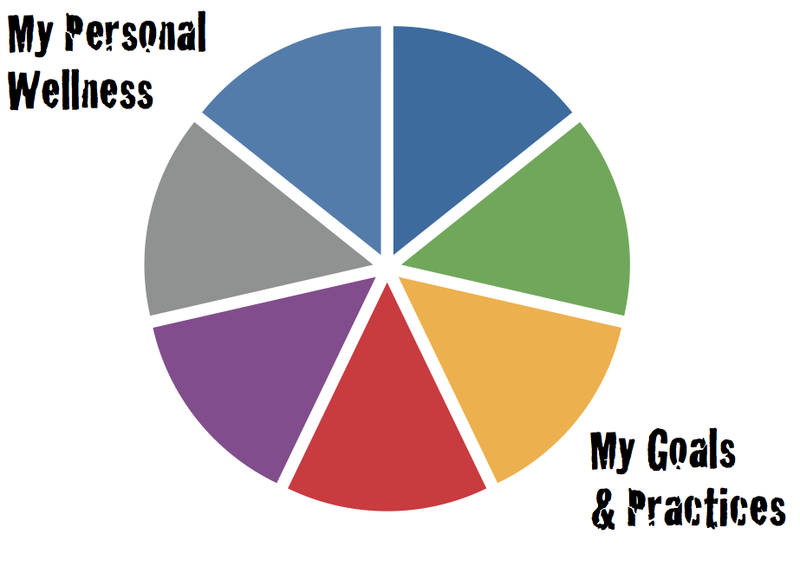 What are your practices? We have included a blank wellness wheel for you to use and make your own!